Protein powders have a number of potentially beneficial side effects, ranging from producing feelings of satiation to encouraging lean muscle gain. However, the powders also have their downsides. Although no protein powder has been directly linked with constipation in scientific studies, it is possible that you will experience digestive difficulties if you fail to follow a balanced diet as a result of taking protein supplements. A variety of factors that can be related to protein intake may cause constipation. Two of the most prominent are dehydration and inadequate fiber intake. Protein powders can contain 20 grams or more of protein per serving and can rapidly boost your daily protein intake if you use them regularly. However, American Council on Exercise scientist Cedric X. Bryant cautions that consuming protein in excess of your body’s needs can result in dehydration. If you’re eating high-protein foods and having protein powder as part of a high-protein diet that limits complex carbohydrates and other fiber-rich foods, you’re also more likely to become constipated because fiber helps food move through the digestive system quickly and efficiently. 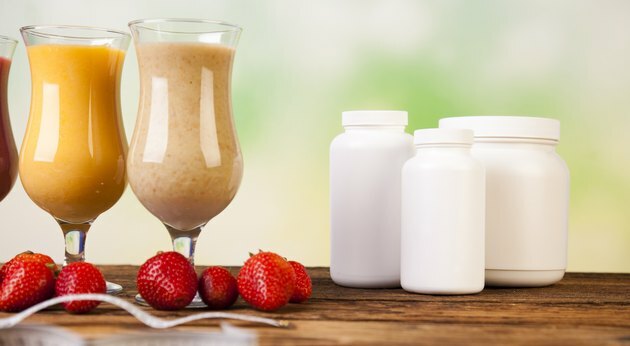 The ingredients in some prepared shakes that use protein powder may also cause or aggravate constipation, and added sugar is one particular culprit according to KidsHealth.org. As a 2007 article from the “American Journal of Clinical Nutrition” states, the primary ingredient of most meal replacement shakes is sugar. Instead of picking sugar-rich shakes and powders, look for those that are high in fiber or that contain primarily natural and whole ingredients. One way to prevent constipation is to simply balance your protein intake with your intake of carbohydrates and fats. The Institute of Medicine recommends that a protein intake of 46 grams per day for women, and 56 grams per day for men. They also recommend 20 to 30 grams of fat per day, and 130 grams of carbohydrate. If you suspect that protein powder is causing your constipation, cut it out of your diet entirely. According to the President’s Council on Physical Fitness and Sports, most healthy adults meet daily protein recommendations through their regular diets and do not need supplements. Although constipation is rarely serious, there are instances in which it can be a symptom of a more severe problem. A report from UCLA Center for Neurobiology of Stress notes that constipation can sometimes be a warning sign of colorectal cancer or thyroid disorders. If you’re considering adding protein powder to your diet or if you already take the powder and are experiencing chronic constipation, talk with your doctor. ACEFitness.org: Are There Any Risks Associated with Excess Protein Consumption?